How to brine chicken, quick chicken brine recipe—why do we need quick? Because usually when I realize I need to brine something it’s too late to make and cool the brine, and then go through the hours of brining. I always brine chickens that I intend to fry. Always. Well, almost always, sometimes, the urge comes too fast and powerfully even to do this, but normally I have at least four hours before I need to get the chicken floured and plunked into the fat. Here’s what I do when I need to brine fast . But. If you want to brine more quickly, make a stronger brine. I double it to a 10% salt solution, 100 grams salt per 1000 grams/milliliters water (gosh I love metric). But there’s still a time issue: if you want to add aromatics and ensure you dissolve the salt, you’ve got to heat the brine (and water takes forever to cool; can’t wait that long). So: When that powerful, powerful urge to have fried chicken strikes at midday, I make a 10% brine but use only half the water. I bring this, along with herbs and garlic and lemon to a simmer, let it steep for 10 minutes, then add the rest of the water as ice (another handy use for a scale, weighing frozen water). By the time the ice is dissolved, minutes, the brine is cool. I throw it all in a plastic bag and leave it at room temp for 2 to 3 hours, remove it, rinse it, and let it rest for another hour or so, to give the heavy salt concentration on the exterior time to penetrate and equalize. And there it is. Ta. Da! Quick-brined chicken. Combine all of the above except the ice and chicken in a small pan and bring to a boil over high heat. Cover and remove from the heat and let sit for ten minutes. Put the ice (or ice water) in a bowl or large measuring cup. Pour the herb brine over the ice. Stir till the ice is dissolved. 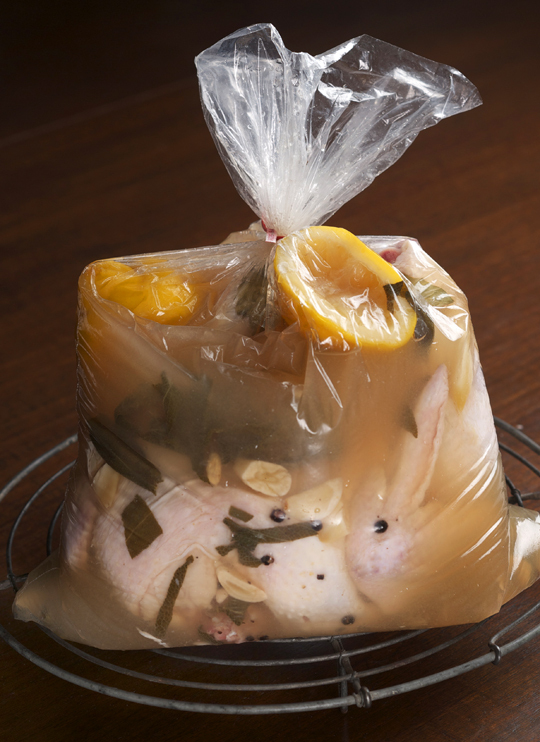 Put the chicken in a plastic bag, pour the brine in, seal the bag, and let sit at room temperature for 2 to 3 hours. Remove the chicken from the bag, discarding the brine. Pat it dry and let it sit out for another hour before using (or you can refrigerate it till needed). Great for roasting, but especially fine for frying. Actually, if it is dissolved completely, while it might come out of solution when the mixture cools, you could stir it back in when you’re ready to use it. I’ve done that, prepping for a big crowd. The problem comes if you wildly over-concentrate: when you cool the mixture, it crystalizes! Fun to do with sugar, and make rock candy, or large crystals of salt, if you want to play with your food. I don’t think if you have a room temperature super-saturated solution the salt that has come out of solution can’t be stirred back in without the addition of some heat. that much salt, harder to control. not necessary, tho i like your thinking too much. and added the 50 g of salt (stirred) and then 550g of ice stir (wait till melted) and pour over the protein…. You could also use an injection. Nice one Chef, this is so simple and easy. Thanks for sharing. made me laugh thinking about when you reallly want chicken and it’s too late to brine. strengthen the salt, good idea. hmmm… brining again…. This brining thing has left me scarred for my cooking life I think. Just cook the chicken… that’s what I do anymore but I am really paying close attention to making the gravy or sauce. For sure if I cook the Thanksgiving Turkey this year… I will be all eyes and ears.. all ears Micahel. i actually don’t like brined roasted chicken, skin too shiny and thin. DO like turkey brined though. it’s the best. Three hours in a cool brine (>3C/40F) plus a room temperature pre-rest seems a little dicey. I would definitely consider adjusting the ice/salt mix to make a cold brine and then refrigerate the chicken in brine. After that, I would have no problem letting the chicken come up to room temperature for an hour or so. If you have salmonella issues with product (and you never know), four hours in the danger zone is really pushing it. That’s what a cooked internal temp of 165F is for….. It may be in the “danger zone” but it is loaded with salt. MR noted that the 5wt% salt ratio brine is also good for sour pickels. In that application the salt kills or prevents the “bad” bacteria from growing. Therefore, one can assume that double the mass of salt would have the same effect or greater affect. Additionally, salomenlla is need air (i.e. its aerobic), something not present in proper brining. There is also Russ’ point about cooking temp. The brine components seem very similar to the one in the Ad Hoc cookbook. Is that your favorite method for fried chicken? I know it is for me, as I’ll never use a different fried chicken recipe. I couldn’t agree with you more, Richard. That fried chicken recipe is the quintessential one for me. I like it even better than the Scott Peacock/Edna Lewis rendition – and that’s saying a lot. richard, victoria, actually, and I know this is brazen, but the brined fried chix recipe in my next book is, a-hem, better than the one in ad hoc. i’ll be asking you to test and say yes or no. Cool, I’ll be adding another cookbook to the shelf then. When is the new book scheduled to hit the stores? I once took a wine and food pairing course at The French Culinary Institute in Manhattan. The favorite pairing of the entire eight weeks was fried chicken with Moet & Chandon White Star Champagne. Alas, it is no longer produced – at least with that name – but Champagne has remained my beverage of choice with fried chicken. What side dishes do you favor? i LOVE the idea of pairing fried chicken and champagne, thank you! Our thanksgiving is coming up and I would never make a turkey without brining it first. Yet I have never thought a chicken needs a brine. I don’t know anyone who brines a chicken…however I always buy a Kosher chicken. In fact, even a lot of non-jews I know buy only Kosher chickens – I wonder if there is a correlation to that. I have been told that there is a distinct taste difference between a market chicken and a Kosher one. I am not talking organic. I’ve never brined a turkey or a chicken; the turkey because the size makes it difficult to brine and store (and maybe because the recipe I use just turns out a great, moist turkey!) but no excuse for not trying it with a chicken. This information is great as most weeknight meals are not something I think of too far in advance so need quick and easy methods to accomplish getting dinner on the table. Ad Hoc recipe? Not for me…nope; for me, it’s Grandma’s, every delicious time! Another Alton Brown tip: he brines his turkey in a cooler. Big enough to hold all the liquid and the turkey, and it’s insulated to keep it cold while it brines. i solved the size/storage issue by asking my purveyor to slice the turkey in 2. i brought my brine to the store and we put approx. 500ml into each sous vide bag along with each turkey side then sealed it on his industrial vacuum machine. i was able to parley this into 2 presentations:one traditional and the other smoked on a weber. Here is a method from Cook’s Illustrated for brining even faster. It also has some explanations. This method is for those who are “blessed” to work in an office and starting your brine in the office kitchen is not allowed. side note: had some coppa made w/ Charcuterie spice recipe (on whole muscle) w/ manchego on a homemade tortilla – it rocked – when’s the follow up book coming out? looking forward to it!! Victoria what was the fried chicken like? Spicy, crispy, what kind of crust – buttermilk? Sounds interesting with champage, thanks. Yes allen, please, the final product, how do you finish your fried chicken? I always use buttermilk as my brine, can i even call that a brine? my friend marlene basically creates a buttermilk brine, it’s excellent, try using 3% salt in buttermilk. You don’t need to weigh your ice. If you work out the mathematical equilibrium of weight and buoyancy, you’ll find that the surface level of of a certain mass of ice-water in a container is the same as the level of an equal mass of regular water. The volume of ice which sticks out above the surface, and thus does not increase the surface level, perfectly offsets the difference in volume between water and ice. So you can measure a volume of ice water just the same as you’d measure the volume of regular water as long as there is enough water to ensure that none of the ice is resting on the bottom of the container. this is why i love this blog. thank you. i’ve always wondered about this but never knew. makes perfect sense. divine in a way, no? i brine my turkey in a big bucket and put it outside where at this time of the year it is cold. I weight it down with a foil covered brick or two. Thankfully the two times a year I do a turkey is October and December. But I could see the alton brown method in warmer climates and summer times…good idea an ice chest. yes, 1.5 oz for 30 oz water for normal brine, 3 ounces : 30 ounces salt water for quick brine. I have used the ice-trick many times. I always said to myself “I know Ruhlman [which I pronounce Rue-maa because that makes it sound more French and thus more worthy of the most important food-writer in my kitchen] would probably slap-me-around Gordon-Ramsay-style if he saw me doing this but I didn’t know yesterday what I wanted for dinner today” (etc). I will feel less guilty next time. Why no sugar in your brine? Oh….you should also try a vacuum brine. Much faster. I use a Multivac chamber vacuum sealer. Also the Reveo Marivac works great for brine. A whole chicken can fit in the tumbler (no tumbling) and it only takes about an hour or two. Also the Marivac is a great marinade system, 20 minutes equals about two days in the fridge. Last you use about 1/2 of the marinade when using a vacuum system. skeptical about efficacy of vacuum brine. Unless I’m using a significant amount of aromatics, I never boil my brines. I simply whisk the salt into room temperature water. It only takes me about a minute or so to dissolve the salt. Is there any reason why I’ve never seen this technique in a recipe? BTW, I just started using a brine pump which is much faster than submersion at getting the brine diffused through meat. However, since the prep time for the brine is much longer, it’s not something I would use if I was in a hurry unless the brine was prepped ahead of time. Star of the South John T. Edge’s yarn-festooned cookbook “Fried Chicken: An American Story” includes John Fleer’s (Inn at Blackberry Farm) recipe for his cooked-Saturday-only Sweet-Tea Fried Chicken. You guessed it, he adds kosher salt to the sweet tea. Another fabulous blog – thankyou. I am planning to roast a chicken for a book club group next Friday and am going to use this method. Not that I ever would, but that foto looks tasty enough to put a straw into! Now I’m off to find a good chicken. Curious…Why are you skeptical on using a vacuum brine? This method has been used in the commercial food industry for years. Vacuum marinade works wonders as well. Think of a marshmallow, under vacuum the mallow increases volume which opens the structure of the marsh. The same happens with meat products allowing the marinade or brine to infuse the product. When the vacuum is released the marinade or brine is trapped in the product. I’ve tested this by weight and it can increase a products weight significantly. Anyhow….give it a try and I think you will be surprised with the results. If you have a foodsaver, freeze or marinade/brine, vacuum with product and see what happens. Not the same but if you like to dry rub products, vacuum seal them to encrust the product. It’s my weekend and I got a nice Bell and Evans young chicken which I want to brine per your instructions Michael. First thing in the morning I am doing this. But I am oven roasting it I think. First I want to read your next post. Also I think I can safely souvide a leg or two using the vacuum bagger olive oil and the Aroma rice maker pro. It seems to keep 160 deg temperature indefinite…using the keep warm setting. I can brown it on the grill and then bag it and put it in the Aroma to keep warm for…a yet to be determined number of hours. Then I can fry a breast per your next post and also roast the other breast half in the nu-wave oven. Actually I can brown it in the Aroma using the steamer setting and olive oil. And having read your comment I think I will rub some compound butter under the breast skin of the chicken half I roast. Thank you again. I’ve been a Sous Vide guy for many years (three circulators and a chamber vacuum system), but why not just take the safer route and olive poach the chicken? A confit basically. Just cover the chicken with olive oil and cook in the oven at 225F until chicken is done (an hour or so depending on your oven). I always add garlic, herbs, and other nice flavors into the oil. Works great for beef, pork, duck, and tuna. Left over olive poached tuna makes the most amazing sandwich the next day! The olive oil method produces the closet thing to Sous Vide (it’s how I got into sous vide) with out all the gadgets and trouble. I understand heating the brining liquid if you use aromatics & want to infuse the liquid, but heating liquid to dissolve salt is a fallacy. Salt and water have an eventual saturation point that heat does not affect. It’s not like sugar whose molecules are not as tightly bonded & heating eventually makes a syrup. I am no chemist, but cooks are chemists in many ways & I have always found this salt/water saturation to be true. If you have undissolved salt, just add more water. I beg to differ on this issue. Temperature does have a correlation to solubility of salt. Try dissolving salt in a pot of water until saturation (i.e., any added salt falls to the bottom, regardless of how much you stir). Now, put that pot on the stove and heat it up. You will find that most of the additional salt at the bottom of the pot will dissolve into solution. Add a lid to the pot to increase pressure, and even more will go into solution. jeeeeeeeeeeezzzzzzzzzzzz….louise…………… I was NOT exiceted about it..whatever that means…………Michael you are great in spite of these shortcomings of yor disciples. My fam loved tha chicken… and they all said it was juicy. Dumb question, from a cooking newbie .. I have read that all salt amounts are not equal, so are u referring to using table salt, kosher salt? Is there some easy conversion to go from one to another? very important question! All salts not alike, especially “table salt” which is usually iodized. avoid this due to its chemically taste. also, unless your using a scale, a teaspoon of table salt contains more salt than a teaspoon of coarse kosher. use coarse kosher salt or sea salt! Ive been using the Thomas Keller brine from Ad Hoc at home, its similar to this one. It comes out fantastic. Great idea! I love brined chicken and I sometimes don’t plan ahead as much as I should – what with work, kids, busy schedules, yada yada yada. Now I have a solution. Thanks! the room temp for 4 hours may be fine for yourself but for guests whos immune systems you may not know are comprimised -transplant, tb, hiv, etc- you might want to avoid this idea. will the brine penetrate the chicken/protein if stored in the refrigerator for the 3 hours and then brought to room temp for 30 to 60 minutes and then cooked? disagree on bacterial issue. unless you are seriously undercooking your bird, immune compromised guest should be fine. as for penetration, yes, that would probably be fine, 3 hrs in fridge. I would like to try your recipe. But could you clarify 2 amounts for me? I generally see that 1 ounce equals 28.35 grams, so the 3 ounces of salt would be only 85 grams and the 15 ounces of water would be 425 grams. What am I missing? Thank you. but if you want to be exact, weigh everything in grams and make a 10% salt solution for a quick brine and a 5% solution for an overnight brine. Thank you very much for answering so quickly. I realized after that I had missed the 15 ounces of ice water mentioned in your recipe. But, I am being picky here, even if an ounce weighs 30 grams, the 3 ounces of salt in your recipe times 30 does not equal 300 grams. I apologize for this but I really prefer weighing ingredients in grams. Thank you for such an interesting and varied blog site. Well that is simple math, it would be 90 grams. Not the whole world thinks metric.